So there we were, sat in Cafe Park Teras, and we were just chatting to owner, Tayfun, about different places we like to eat around Fethiye. How on earth do you live in town the size of Fethiye for 11 years and not know about a köfte place that is supposed to be legendary? Well, we’ve managed it, it seems! You know us; we’re suckers for a good köfte ekmek, so of course we needed to go and hunt out this Köfteci İmadettin. But not until we’d asked a couple more friends the have-you-heard-of-Köfteci-İmadettin question. And when the reply from both was, “Everyone’s heard of Köfteci İmadettin,” you just wonder where you’ve been for the last 11 years. “Is it good köfte,” we asked. Is That Praise, Or Not? That was about as far as we got with the other two friends. Not quite as enthusiastic as Tayfun, then, but we were already sold. Tayfun had told us where Köfteci İmadettin is – and we wondered how we’d never noticed it. 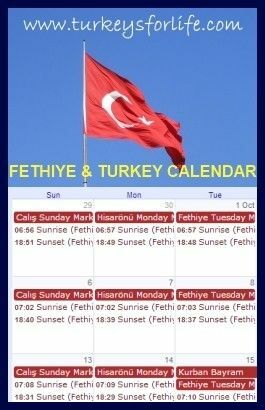 Granted, it’s tucked down a side street in the centre of Fethiye, but still…11 years and we didn’t know about it? Exasperation! We needed to put that right. Saturday, the sun shining…a little stroll into town for a cheap köfte ekmek lunch sounded just perfect. So off we went. It was busy! Maybe we were the only people in Fethiye not to know about this place. We sat down and ordered our köfte ekmek and an ayran. And we can be quite picky when it comes to köfte ekmek – we’ve sampled more than a few in our time. It arrived within minutes. And it was indeed a piece of paper with an open, toasted ekmek filled with grilled köfte, shredded lettuce and chopped tomato. We sprinkled more chilli powder over the top. And Barry knew what he was looking for, too, when he started laughing and shaking his head. “Turn round and look at the fridge,” he said. Yes. We didn’t know about Köfteci İmadettin’s famous köfte but there, in their little establishment, stuck to the fridge, is a Turkey’s For Life photo. It even still says ‘Turkey’s For Life’ in the bottom corner. And, guess what? The photo is taken from Cafe Park Teras; Tayfun’s bar. Now, there’s a little coincidence for you. Guess we were destined to go to Köfteci İmadettin one day. Köfteci İmadettin is in the centre of Fethiye on a quiet side street that runs between 96 Sokak and 97 Sokak. The 96 Sokak entrance to the street is directly opposite Şamdan Restaurant. Both 96 Sokak and 97 Sokak run off the main Çarşı Caddesi in the centre of Fethiye. For other ideas of where to eat and drink in Fethiye and around, take a look at our Fethiye eating and drinking page. Köfteci İmadettin Göktaş was well known all over Fethiye and sadly passed away in 2009. His family continue the business. Çiğ Köfte – With Meat Or Without Meat? Fate, destiny, call it what you will. Your name was on the fridge door.